Naked streetbikes have overtaken faired sportsbikes in terms of popularity. And why not  they're nearly as much fun in most conditions while being more practical as well as easier to ride. The middleweight naked segment has gotten particularly popular, raking in volumes for manufacturers and introducing more and more bikers to the enticing world of fast motorcycles. And Triumph's Street Triple and Kawasaki's Z800 need no introduction, having done well for both of the respective manufacturers. It was a fierce battle then, and this year sees both the motorcycles arrive as all-new replacements for the outgoing models. The Triple S looks promising, offering the same friendliness, agility and easy performance while being more powerful - 79PS becomes 113PS this year! The Kawasaki Z900 on the other hand is lighter, meaner looking as well as more powerful. It promises to improve upon the two things that the outgoing Z800 had - weight and the slower handling that went with the heft. Time to unleash them on some of our favourite riding roads. Given the positioning and price range, neither the new Street Triple S nor the Z900 will let you down. The design of the Street Triple S is a mild disappointment. It looks way too similar to the older bike which means there isn't too much novelty on offer to the buyers. The front-end design is uniquely Street Triple. You'll love it or you'll hate it, but it's part of the motorcycle's history and legacy. The fly screen is useful but a little disproportionate to our eyes, though it does add some freshness to the design. The S though gets the same clocks, more or less, as the old model. Walk around and you realise that it isn't just the front end that's similar to the older Street Triple. In fact, the entire motorcycle looks pretty much the same. The fuel tank, seat and rear end aren't too different from the Rx. I won't say the design looks dated, but someone waiting for an 'all-new' Street Triple might just have to wait longer. The good news though is that the Triple still looks as compact, sporty and friendly and doesn't carry the visual bulk its competitors, including the Z900. The Z900's styling moves closer to the Z1000, and is curvier than the Z800's edgy design. It has a lot more visual mass than the Triumph, and Kawasaki has really gone to town ensuring the 900 looks evermore like a full-blooded litre-class naked. The front is meaner looking with the same hunkered-down stance as the Z1000 as the fuel tank shares a lot of the visual bulk along with the 4-pot motor. 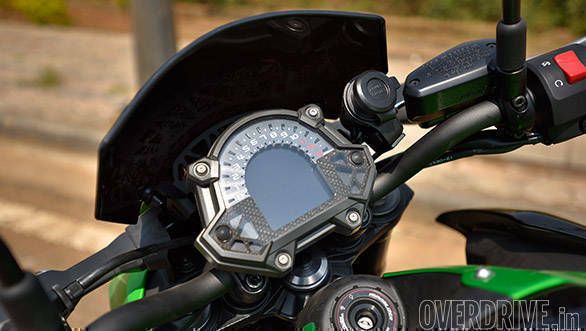 The instrument cluster is a disappointment as it looks very similar to the relatively affordable Z650's, save for a faux carbon-fibre strip. The Z-shaped tail light is a nice touch and on the whole I've no doubts that the Z900 is the more attention-grabbing motorcycle here. When both bikes are parked next to each other, your eyes are more likely to wander to the bright green and larger Z900 rather than the blood red svelte Street Triple S. The quality of the switchgear and plastics, and fit-finish levels on both are good, though the Kawasaki boasts slightly better quality. Even the wiring visible from the rider's perspective on the Z900 is neater, which lends it a more premium feel. Our test Z900 came equipped with the full set of optional accessories that were being offered as mandatory until last month. These aren't merely cosmetic bits and include front fork protectors, a fly screen, frame sliders, radiator guard, tank pad, seat cowl and a charging socket. There's a range of accessories on offer with the Triumph as well, but our test bike came with none. 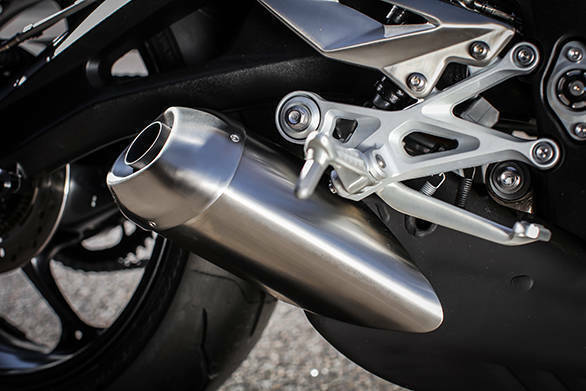 Given that the new bike has a lower price and none of these accessories, we are going to ignore them for this test - although the radiator guard, fork and frame sliders should be the first aftermarket parts you add to your new machine. The Z900's inline-4 engine is a scaled down-version of the Z1000. It displaces 948cc and offers 125PS and 100Nm. The Street Triple's motor grows to 765cc, producing 113PS and 73Nm. While still significantly lower than the Kawasaki, these numbers are a lot better than the previous Street Triple's. 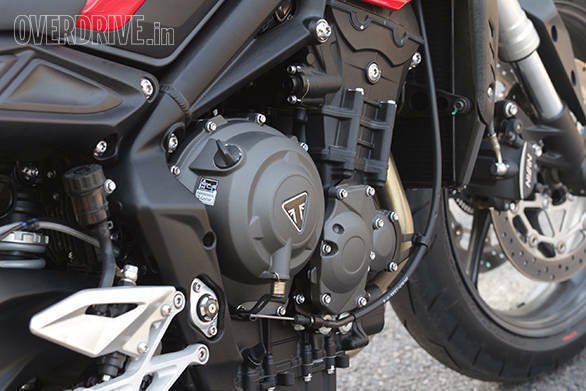 It is also worth noting that the Triumph engine is higher strung and produces peak power at 11,250rpm as compared to the Kawasaki which produces 125PS at 9,500rpm. There is a big difference between the two motors right from the moment you thumb the starter. The Kawasaki idles with the typical 4-cylinder hum while the Triumph sounds raspier. There's a noticeable difference between the way power is sent to the rear wheel too as the Kawasaki feels punchier right from the word go with more shove at low revs. 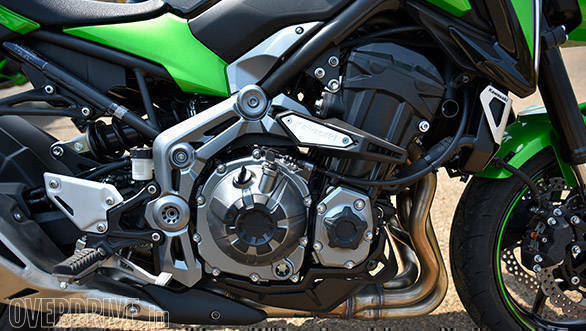 Of course, the fact that the Z900 produces 25 per cent more torque helps matters. The Z900 is also geared lower than the Street Triple which helps its cause against the 25kg lighter Triumph. And of course, the Z900 has lost 21kg over the Z800 which helps acceleration as well as handling - I'll get to that in a moment. 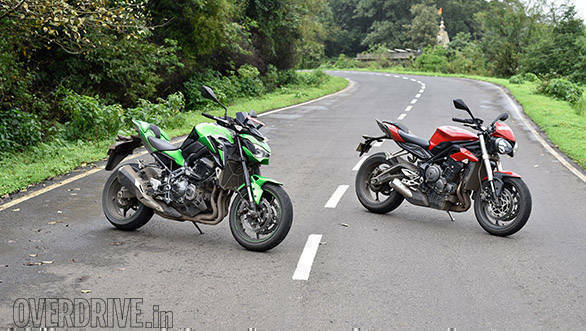 In feel, the Z900 feels quicker than the Street Triple as its engine revs quicker. But the numbers say different. 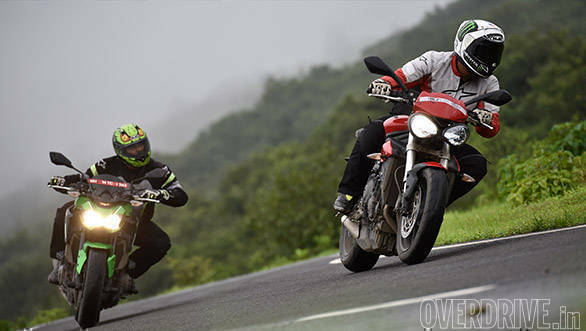 The lighter weight helps the Triumph accelerate to 100kmph in a scant 3.59 seconds as compared to the Z900's 3.7 seconds. Its higher outputs help Kawasaki outperform the Triumph after that. It is quicker to the 160kmph mark and over the quarter mile. The Z900 sprinted to 160kmph in 7.57 seconds. The Street Triple on the other hand took 7.88s and 11.99s respectively. The Z900's in-gear acceleration is stronger too with instant response to throttle inputs, while the Triumph makes you wait a wee bit more before offering the full blow, especially from low revs. Differences when riding fast in traffic aren't significant though, and both motorcycles are neck to neck in terms of commuting. What is noticeable though is the Kawasaki engine. The Z900's engine originally belonged to the older ZX-10R which explains the higher refinement levels. By a small margin, the Kawasaki motor also feels cooler to the legs in slow traffic or when stopped. Another noteworthy difference is in the character of the two engines. The Z900's motor is all clinical precision and silky smooth feel, while the Street Triple's engine feels more playful with its theatrics and has a slight gruffness that's intrinsic to the bike's character. 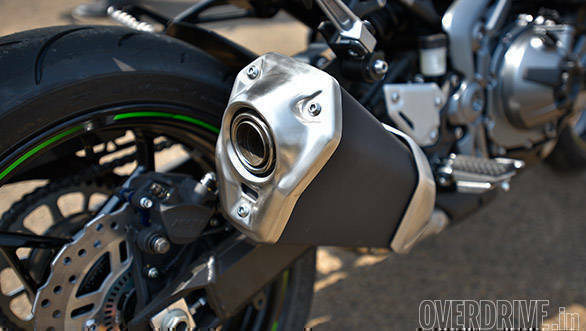 What's more, the Z900's clutch action is extremely light, which makes it easier to ride even in the worst of traffic, while the Street Triple's lever calls for more effort. Kawasaki's gearbox feels slicker to use too, offering smoother, easier shifts than the Triumph's. One major difference between the two motorcycles is the electronics package - the lack of it on the Z900 to be precise. 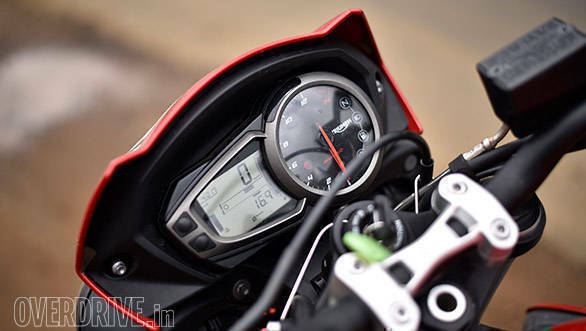 The Street Triple is now ride-by-wire which brings with it riding modes and traction control. 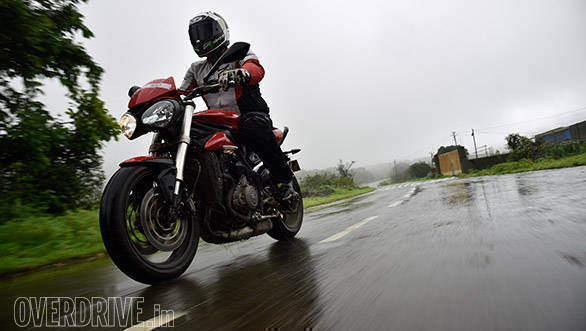 Rain mode and traction control will be invaluable to new riders learning the art. The Z900 only gets ABS in the name of electronics, and has no rider aids whatsoever, which means you are on your own in tricky situations. Its smoother throttle response though ensures you won't get intimidated, and giving it the beans is never a scary experience. But in iffy conditions, new riders should have some help and I guess the next model change will definitely add traction control to the Z900, but that's still at least two years away by my reckoning. Given the differences in size and weight, you wouldn't be wrong to assume the Street Triple will trounce the Z900 in this department. You couldn't be further from the truth. The Z900 is up there with the Street Triple in terms of plastering a smile on your mug despite its bigger dimensions and heavier weight. The Street Triple S carries on its delicious legacy - it is a fantastic handler. It feels light, agile and sure-footed enough to make you want to ride it like a hooligan. Be in the hills or city, the Triumph is always game with its light, confident front end that's quick to change direction. It loves being flicked from side to side, leaned hard into corners or slicing through traffic. 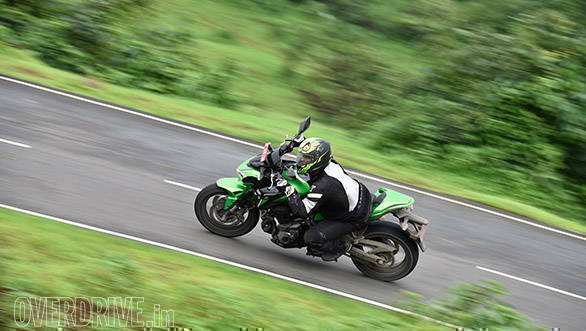 And now, the Z900 feels equally adept at doing it all. The biggest improvement Kawasaki has made to the 900 over the 800 is lightness of the front end. In fact, the front is so quick to respond that there were times when I felt the rear couldn't keep up with its alacrity, particularly around fast chicanes. The Z900 surprised me with the way it masked its heft on city streets too  particularly thanks to the suspension set-up, which feels ever so slightly stiffer. The suspension helps the Z900 make rapid progress, and once on the move it doesn't feel significantly larger than the Street Triple. The firmer suspension is a trade-off when it comes to ride quality though, but the stiffness is just about enough to let you realise the difference between set-up of the two bikes. The Street Triple feels slightly more plush but there's no way you can call the Z900 stiff as it feels as adept at handling potholes and undulations. The Street Triple is natural at being fun to ride as there's enough performance to enthuse experienced riders, along with a friendliness to introduce inexperienced ones to the fascinating arena of 100PS+ motorcycles. The Z900 though is the surprise package as its muscular stance, larger dimensions and heavier kerb weight might coax you into thinking it is a machine for experienced riders. Inexperienced riders will be surprised at how easy it can be to ride fast, as the Z900 does everything the Street Triple does with utmost ease. The two bikes are thus matched on most fronts very closely, but what sets them apart is the difference in pricing. The Z900, imported as a CBU from Thailand, is priced at Rs 7.68 lakh ex-showroom New Delhi, which is a lakh lower than the Street Triple's ex-showroom price of Rs 8.62 lakh, which comes in via the relatively affordable CKD route. Talk about on-road pricing and the Triumph again costs a lakh more, retailing at Rs 9.59 lakh on-road Delhi, as compared to the Z900's on-road price of Rs 8.51 lakh. Let's be clear that the difference in feel and capability between the Kawasaki and the Triumph is not all that much anymore. The Street Triple is cheekier but the Z900 matches that by being able to get up to mischief but generally feeling slightly more mature. The big difference from the new rider perspective is the lack of traction control on the Z900 though ABS is standard on both. We do believe Triumph missed the opportunity to bring the price of the Street Triple down further and that's why the Kawasaki is a winner here. The Rs 1 lakh difference in price is hard to justify on value, features and capability terms.